It doesn’t matter what you putting into your storage unit you should write out a separate inventory list. Too often, renters forget what they have in that unit and will buy something when they could simply pull it out of the unit instead. That is especially true with furniture or winter clothing. If you’re packing up a lot of boxes in your unit then you should definitely number each box. Those numbers should then have a corresponding inventory list. That will help you keep track of things like decorations or collectibles. 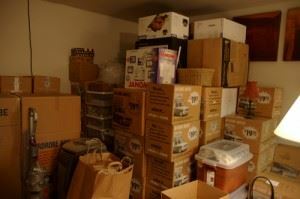 Every box you put into a storage unit should be full. They may be some other “empty” spaces that you could also use for packing. Dressers, suitcases, trunks and even a refrigerator can be repurposed as storage containers within your storage unit. Storage units aren’t going to be free of dust. That’s why you should wrap up your furniture before putting it into the unit for the long-term. You can use professional movers’ blankets or your own old blankets. It might help to also disassemble the furniture before putting it into storage to make even more room in the unit. It would help to put your stored items up on pallets. That’s especially important if your unit is located outside on the ground level. A storage unit is an additional cost that you have the budget for on a monthly basis. You shouldn’t waste that money by packing up junk you would normally consider throwing out. Before you get to that point, you want to bring in Junk King Columbus. These are the junk removal professionals who will quickly load up all the things you want to get rid of. They will make sure they are properly disposed of. Before you load up your storage unit, be sure Junk King Columbus hauls way the rubbish. This entry was posted in columbus junk removal and tagged clutter, junk king columbus, junk removal, rubbish, storage unit on July 31, 2017 by Junk King. Last updated July 31, 2017 .